Do you often make way too much pasta and end up with a pan full after your meal? The fight against food waste can start in the kitchen with these 3 tasty recipes which will help you recycle your leftover pasta! We recommend using Vorrei’s bronze die cut pasta in all of your pasta dishes. It retains its shape really well after cooking and won’t be soggy when you come to use again for your leftover recipes. This is the classic Italian family recipe for using up pasta – it works really well with spaghetti and tastes amazing – it’s a real hit with our kids who turned their noses up until they tried it and loved it! The spaghetti should ideally be plain (i.e. without any sauce). Of course you can always prepare some spaghetti if you fancy trying this and don’t happen to have any leftovers!! Beat the eggs in a bowl & add the chopped ham and then the milk & herbs. Add some salt and pepper and mix together. In a frying pan heat the clove of garlic in some olive oil until it becomes lighter in colour, then remove it. Add the leftover pasta to the frying pan and let it fry for a couple of minutes before touching it. Cover the spaghetti evenly with the egg mixture. Leave to cook for a few minutes and then add the grated parmesan, cover with a lid. Leave to cook on a fairly low heat for about 15-20 minutes. Turn the omelette and cook without the lid for another 5 minutes or so. When ready cut into pieces and serve. The omelette can be kept in the fridge for 2 days. 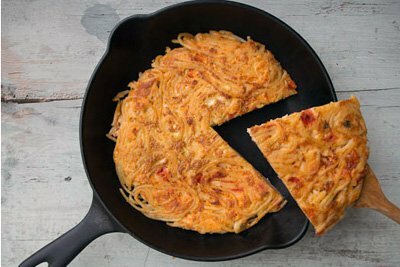 You can really add any ingredients you have left in the cupboard or fridge like to this tasty leftover pasta omelette, we also like to add chopped Mozzarella. This is a super quick and easy way of using up some leftover pasta such as penne or any ‘pasta corta’ (rigatoni, fusilli or farfalle for example). This salad makes a great, speedy-to-prepare packed lunch too! 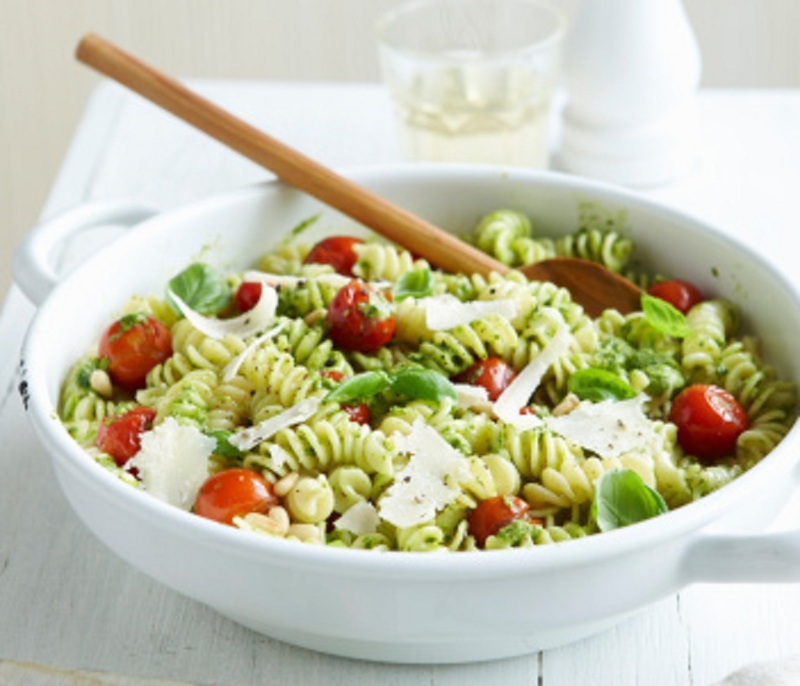 Empty your leftover pasta into a large bowl and stir in the pesto – as little or as much as you like. Add the halved cherry tomatoes/sun dried tomatoes, capers and basil. Drizzle with a little lemon juice and sprinkle with the parmesan shavings. With leftover spaghetti, linguine or any other type of long pasta you can make delicious croquettes. You will just need to chop the pasta into small pieces before starting. Chop the leftover pasta into small pieces and mix in a pan on a low heat with the melted butter and parmesan. Leave to cool. Add one beaten egg and a pinch of salt to the pasta mix, stir together and leave the mixture in the fridge for one hour. If the mixture is really runny, firm it up with some flour. Chop the mozzarella and ham into pieces and divide them into 8 portions on a floured work surface. Squeeze the ham and mozzarella together into a ball. Remove the pasta mixture from the fridge and divide into 8 portions. Make it into a ball with the mozzarella and ham in the middle of each one. Roll each croquette in a little flour and then in the remaining eggs which have been beaten with a pinch of salt and finally in the bread crumbs. Fry in plenty of hot oil until golden and drain on some kitchen roll. Serve with a side salad or a portion of veg.